Can these strong performers keep up their momentum? Stocks have been extremely strong, with the market having seen impressive results over the past eight years since the financial crisis. Yet some individual stocks have crushed the overall market with outrageous gains. 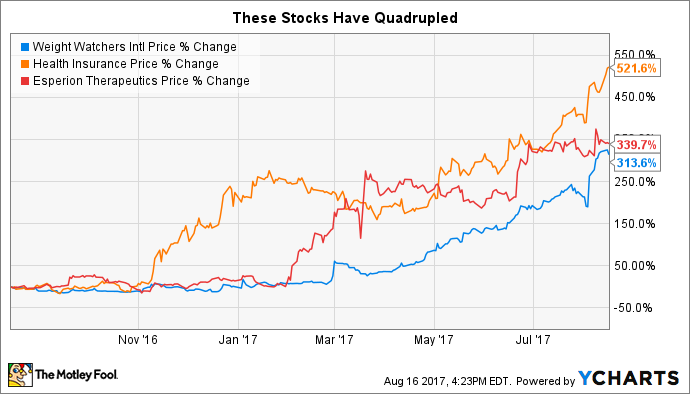 Weight Watchers International (NASDAQ:WTW), Esperion Therapeutics (NASDAQ:ESPR), and Health Insurance Innovations (NASDAQ:HIIQ) have all managed to quadruple or more in just 12 months. Investors who've seen these stocks for the first time recently want to know if they can score any further gains from these companies. Below, we'll look more closely at them to see whether there's anything left in the tank for these high-flyers. Weight Watchers International has gotten a lot of attention in recent years, notably from the presence of high-profile investor Oprah Winfrey. Yet even though Winfrey's initial investment earned a lot of exposure for the company, Weight Watchers has continued its upward momentum purely from business results. In the first quarter of 2017, Weight Watchers reported an impressive 16% rise in subscribers, reaching the 3.6 million mark and rising for the sixth straight quarter. The positive sentiment from a rising audience and an increase in paid weeks for weight loss programs offered by Weight Watchers continued into June, lifting the stock still higher, and the second quarter brought even better results. Looking ahead, Weight Watchers has a new CEO, plans to update its programs, make enhancements to its digital offerings, and expects to make meetings more useful for its members. That's a potential recipe for success going forward, and it's why investors are excited about Weight Watchers right now. Esperion Therapeutics has focused its attention on developing drugs to battle cardiovascular disease, and like most biopharmaceutical companies, Esperion needs to show successes in its pipeline in order to make progress toward reaching its long-term goals. Back in February, investors started bidding up the stock after a similar treatment from a rival drugmaker raised the chances that its cholesterol-lowering treatment, bempedoic acid, would eventually gain approval from the U.S. Food and Drug Administration. That excitement got stronger heading into spring, as Esperion specifically said that it expected the FDA to accept a New Drug Application for the treatment based on data from the trials it was conducting, with an anticipated timeline of 2019. Fears about the ability for Esperion to have strong pricing power moderated those gains somewhat, but favorable trial results released earlier this month gave bullish investors reason to celebrate again. With a long timeline ahead of it, Esperion shares could see volatility in either direction, but if the trials keep going well, then further gains are quite possible. Finally, Health Insurance Innovations is the big winner on this list, having jumped more than 500% in the past year. The provider of short-term health insurance and hospital indemnity plans has seen a big jump in demand for its policies, and the corresponding rise in revenue and profits made the stock extremely intriguing. Just about the only hiccup in its share-price advance came in March, when company founder Mike Kosloske sold about $42 million in stock in a secondary offering. Further gains have come due to the flexibility of Health Insurance Innovations' plan offerings compared to traditional health insurance. Even as healthcare reform efforts have moved forward in fits and starts, Health Insurance Innovations has catered to those who need supplemental coverage to their regular insurance or need specialized products like dental insurance. No matter whether Obamacare or Trumpcare end up being the law of the land for healthcare, Health Insurance Innovations seems poised to be able to tailor its offerings to meet its customers' needs. Stocks like these inevitably appear in long bull markets, and each of the three companies has a lot going for them. As long as the favorable conditions that have spurred their respective gains remain in place, the potential for further share-price appreciation will be there for investors looking to get into these stocks now.